It's a new challenge at Just For Fun Rubber Stamps and this month we challenge you to use blue and silver. 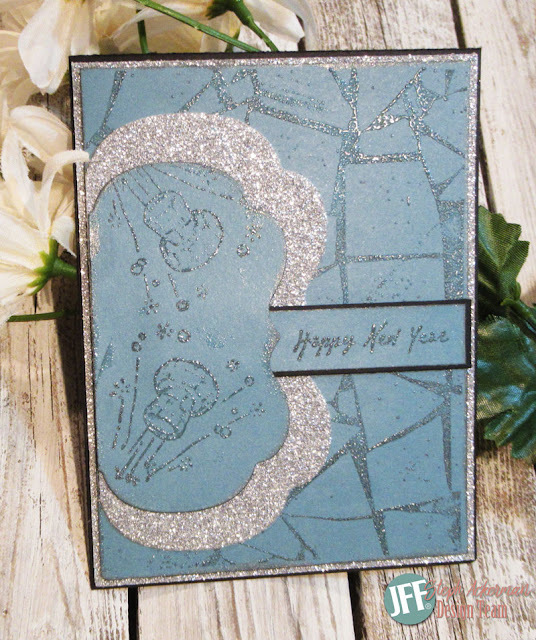 I used the Crackle Texture stamp, stamping it with silver ink on a blue panel. The panel was matted with silver and black cardstock. Using the Popped Cork stamp with silver ink, I stamped it on a die cut panel twice and added it to the card atop a die cut silver panel. For the sentiment, I stamped one section of the New Years Frame with silver ink on a scrap of blue. Once matted, I placed it behind the popped cork die cut. I sooo need that popped cork stamp! Happy New Years Steph!